This book is a guide to concepts and practice in numerical algebraic geometry - the solution of systems of polynomial equations by numerical methods. Through numerous examples, the authors show how to apply the well-received and widely used open-source Bertini software package to compute solutions, including a detailed manual on syntax and usage options. The authors also maintain a complementary web page where readers can find supplementary materials and Bertini input files. 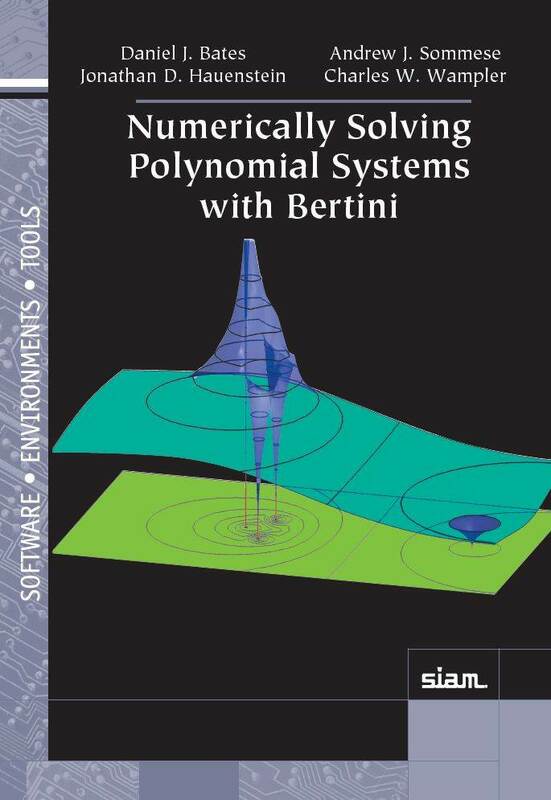 Numerically Solving Polynomial Systems with Bertini approaches numerical algebraic geometry from a user's point of view with numerous examples of how Bertini is applicable to polynomial systems. It treats the fundamental task of solving a given polynomial system and describes the latest advances in the field, including algorithms for intersecting and projecting algebraic sets, methods for treating singular sets, the nascent field of real numerical algebraic geometry, and applications to large polynomial systems arising from differential equations. Those who wish to solve polynomial systems can start gently by finding isolated solutions to small systems, advance rapidly to using algorithms for finding positive-dimensional solution sets (curves, surfaces, etc. ), and learn how to use parallel computers on large problems. These techniques are of interest to engineers and scientists in fields where polynomial equations arise, including robotics, control theory, economics, physics, numerical PDEs, and computational chemistry. Scientists and engineers needing to quickly solve systems of polynomial equations, particularly those looking only for isolated roots, will find what they need in the "Bertini Quick Start Guide," part of the detailed "Bertini Users Manual" in Part IV of the book. These readers may also wish to refine their technique by reading Part I. Engineers or scientists and senior undergraduate or beginning graduate students with a computational focus who have a knowledge of calculus, linear algebra, and undergraduate-level ODEs can become expert Bertini users by studying Parts I and II, including the examples and code, which is available online. Those with a more mathematical bent can find details of the underpinnings of the methods in the more technical sections (marked with an asterisk throughout the book) and can read descriptions of the latest developments in Part III.